This small house has been in Sheridan since 1895, but throughout its long history, there have been only two types of businesses here: doctors and lawyers. Ernst Lever’s physician office was found here until the 1930’s, when it became the office of Dr. Richard Crane and his wife Beatrice, who was a music teacher. 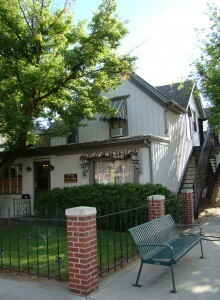 Rogers physicians office followed until it eventually became Healy Law Firm in 1984.